Who says Sangria is only for Summer entertaining? Look what we found on-line at Zulka Sugar. Another crowd pleasing drink with a twist that will surely become a staple at your winter and holiday gatherings. Enjoy! Mix together the cinnamon and sugar in a small bowl. In another small bowl, pour a little of the brandy. Dip the glasses in the brandy and then the cinnamon sugar. Add a few apple slices to each glass. Set aside. Pour the remaining cinnamon sugar in a large pitcher. Add the apple cider and stir until the sugar is dissolved. Top with the brandy and wine and mix. Add the rest of the apples. Chill until ready to serve. Add the sparkling cider right before serving. Garnish with an apple slice and a cinnamon stick. Serve chilled. Add ice if desired. 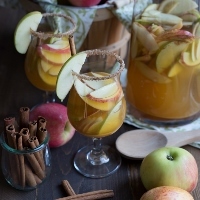 This entry was posted in Cocktails and tagged Apple Cider, Apples, Brandy, Cinnamon, Sparkling Apple Cider, White wine, Zulka Sugar. Bookmark the permalink.